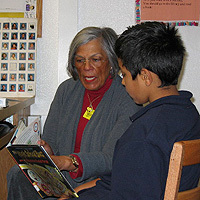 Mary King helps students with reading at Normandie Elementary. "I'm excited. It feels good to go back in and get my feet wet. I hadn't realized how much I missed being around a school and its endless energy. I eagerly look forward to this next chapter in life." David Jacobs teaches a Film Theory class at Belmont High School. "I've just finished my first semester as a Primetime volunteer at the Belmont School, and though I'm going to continue—in fact to double my hours in the new term—I have to admit to feeling a bit guilty. When I set out for my first day at Belmont, I was probably wearing a halo (similar to the type worn by people who have just traded in the Mercedes for a Prius). How wonderful I was—a comfortably situated person retired from a successful career, virtuously going downtown in heavy morning traffic to impart my wisdom and enlighten young lives. And I did impart and I did enlighten. But what took me by surprise was the realization at the end of the term that I had become the most enlightened person in the classroom, and mine the life most elegantly enriched. My career in television was great. I had high—quality flops and trashy hits and more fun than anyone should have at a paying job. One of the shows I created was among the most successful dramatic series ever on TV, a worldwide phenomenon—and that was a heady experience. But nothing I did during those 25 years—nothing—was headier than the moments in the Belmont classroom when I turned the projector off and the lights on and confronted 20 hands raised insistently over the heads of a room full of kids eager to start talking, analyzing, figuring it all out. Hence the guilt—I'm getting way more than I give. But I can live with it. In fact, I'm thriving on it. Primetime sure works for me."